It's been a long time since I considered myself someone who doesn't try out of fear of failure. I mean, there are things I won't do to avoid embarrassment (like dancing), but I feel like I get in there and try on things that really matter to me. But a few days ago, I started thinking of things that I would do if I couldn't fail. If I was guaranteed success, what would I do? Well, my list wasn't very long and wasn't incredibly serious, but I thought I'd share what I came up with. I love basketball. I played all through middle and high school and I hate that I am too out of shape to play now. After I won the food competition, I would start a legit diet and since I wouldn't fail, I would lose the weight that I want so badly to lose. Good plan, right? I hate dancing. I am seriously worse out it than anyone I've ever met and I feel awful about myself every time I dance. But if I could actually get better and I wouldn't fail, I would take dance lessons and surprise everyone next time there's an opportunity to dance. I think most of these are just silly and fun, but there are some things I can learn from this list. I think that I should not be so afraid of dancing. Dancing is meant to be fun and I should not loath myself every time I dance. I don't need to be guaranteed success to try to improve, or maybe even one day take lessons. We get so bent out of shape when we fail, but the thing is, life offers no promises of success. When we try intimidating things, we have to know there is a chance we will fail. But that's ok. Some of our best lessons are learned when we fail. No one wants to fail, but it happens. And when we don't fail- those brilliant times of success- how awesome is that?! I also think that maybe we all have things that we are afraid to do. You may surprise yourself if you make your own list. Maybe you should try it. 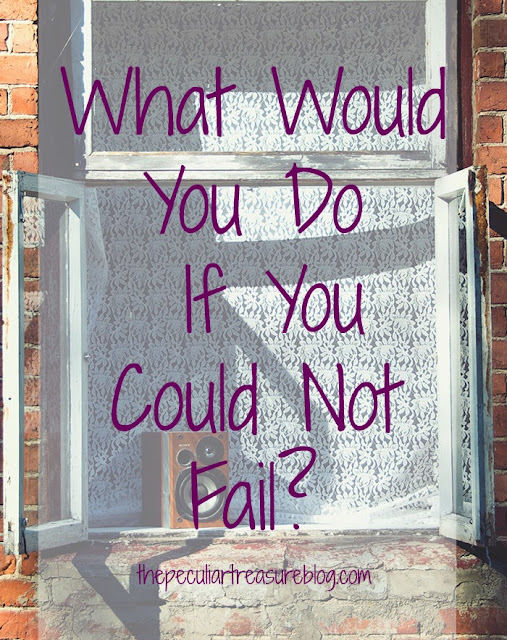 What would you do if you knew you wouldn't fail? Fun post. I would run a marathon, audition for a Broadway show, and apply to work at the Disney archives. Those are awesome things to do! You should at least do one of those! Try it! these are awesome :) I would start an online handlettering business. I have wanted to start it but I'm too scared! How awesome! Don't be afraid! Go for it! Love your list! I would love to open a cafe in our community benefiting needy communities abroad! Oh my goodness, I know exactly what I'd do. I'd become a famous painter and live in Tuscany with my own vineyard. Hey Kristin! Did you re-design your blog? I love it!!! I love the theme of this post. I think that if I knew I wouldn't fail...I would try out for the Voice. lol!! Nice one! I would love to do something like that too! This is fun to think about! So out of my personality, but I would sing and perform. LOL! And I would write a children's book. I love children's books and loved reading to my son when he was little and always wanted to write one. You should try to write it. You could self-publish. No harm in trying! It can actually be a difficult question sometimes. YES, GIRL! I love this! And I used to have SUCH anxiety about dancing, oh my goodness, but now that I've had to do it on stage a bunch of times (and trust me, I am not good! haha) I have lightened up a bit on myself, which has helped. 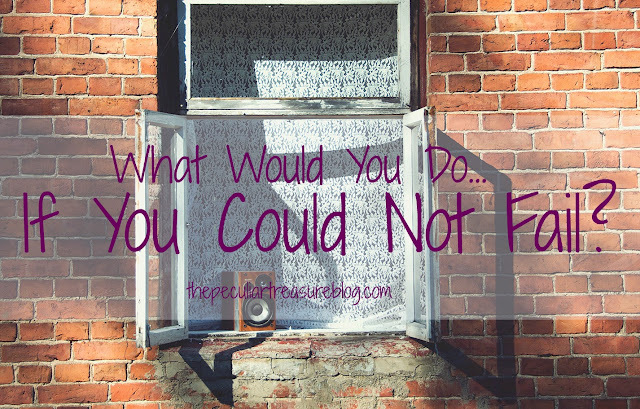 I love your list of what you'd do if you could not fail. For me, it's probably all that plus open my own bakery/sandwich shop that would also sell local handmade goodies. Maybe i'd be a VS angel (since we can't fail here). I'd also work for the Wake A Wish Foundation and make my blog go viral! That's hilarious! You're husband must be an awesome man! haha. This post is really fun and got me thinking, but I really couldn't think of anything exciting except totally unrealistic stuff like be a rock star!! Love these! I would take up singing. I'm awful right now haha but it would be so fun. I love singing! If you can find lessons, do it! You might really love it! Honestly, Entering Cupcake Wars would definitely be on my list! I would also matravel every country (failing here would mean that I would travel myself until I was completely poor, etc. haha!) And I would become a mom later in life if I knew I could not fail. This post is so fun! I love your list, especially being on Cupcake Wars! I so want to do a cupcake competition. I think being on a show like cupcake wars would be so fun!